I got to watch Donnie Hart pitch against the Astros last summer in Camden Yards, that was cool. I also got to watch Goldy play in Denver last May. It was neat watching guys I had watched in Bobcat Ballpark play in some MLB stadiums. Carson Smith is scheduled to undergo season-ending shoulder surgery on Wednesday. Another career setback for the 28-year-old setup man, who has logged just 23 2/3 innings at the major league level since the Red Sox acquired him from the Mariners in December 2015. He will be eligible for arbitration for the second time this winter and could be a non-tender candidate because of the poor health. RALPH, THE SWIMMING PIG, LIVES IN MY HEART! was really worried about goldy when his slump went so long, but damn if he isn't coming out of it like a beast! Paul Goldschmidt's 14 XBH in June are the most in MLB. He had just 6 XBH in 26 games in May. Goldschmidt's 7 HR in June also lead the majors. Baseballs, beware: Paul Goldschmidt is feeling it. The @Dbacks slugger's 450-foot HR tonight in Denver is the longest oppo blast by a RHB since #statcast began tracking in 2015. It’s been a tale of 2 seasons for Paul Goldschmidt. First Diamondback in franchise history to have 4 consecutive extra base hit games. Side note, Donnie Hart was just called back up to the Orioles from AAA thanks to an injury. Jonathan Ortega was Boston's 19th round draft choice this June out of Texas State University. He was hitting .326 in 16 games for Lowell playing SS, 2B, and 3B. And now he is in Triple-A! from draft to pawtucket in 2 months! 5. Who is the most underrated player in the game? Notes: There was nothing approaching a clear consensus on this question — except in the NL West, where Goldschmidt won handily. Austin Willams, round 6 pick in the 2014 draft has been called up by the Washington Nats.!! even though he contributed absolutely nothing to the sox this year, and spent 90% of the season on the disabled list, i sure hope carson smith gets a world series ring. anyone know if that would make him the 1st bobcat w/ a ring? If he played at all for the Sox in '18, he'll be at least voted a partial share. Humble, that's me... Mr. Modesty. When it comes to humility, I'm the greatest. The Carson Smith era with the Boston Red Sox could have been a good one, but instead it was an unmitigated disaster. Though the writing had been on the wall for months, the Sox and Smith officially parted ways Thursday. The team announced he had been activated from the 60-day disabled list and outrighted off the big league roster after clearing waivers. Smith, as a result, elected to enter free agency. The relief pitcher was acquired from the Seattle Mariners along with Roenis Elias prior to the 2016 season in exchange for Wade Miley and Jonathan Aro. At the time Smith was acquired he was coming off his best big league season (and the only one that lasted more than 18 appearances), posting a 2.31 ERA over 70 appearances as a high leverage reliever with the Mariners in 2015. His time in Boston, however, was bumpy. He appeared in three games for the Red Sox in 2016 before undergoing Tommy John surgery that May. He missed nearly all of 2017 while continuing his rehab from the surgery, but was back in time to pitch in eight games in September, posting good enough results (1.35 ERA over 6 2/3 innings) to inspire confidence for 2018. In 18 appearances this season he had a 3.77 ERA, but his campaign concluded in May after suffering a shoulder subluxation by throwing his glove in the dugout out of anger. In response to the injury, he took a veiled shot at manager Alex Cora, saying his arm was fatigued from overuse, which must’ve player a role in the “freak” injury. Cora responded by noting Smith never said anything and that he would’ve stayed away from him if he knew that. Smith was entering his second year of arbitration and likely was going to command a little under $1 million in 2019. Still, at this point it seems best the two sides go their separate directions. News on Yahoo! 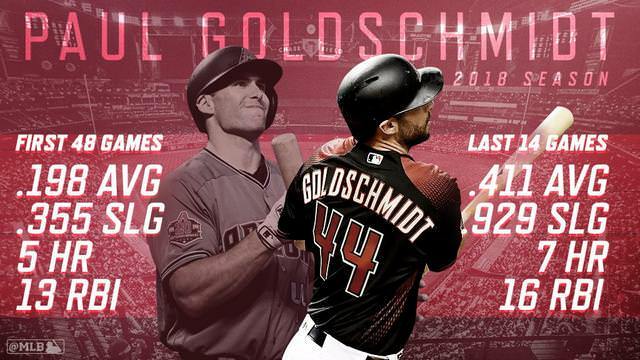 Sports is that AZ is seriously shopping Goldy. I sure hope so. They are not mentioning who but of course I would pray for my Rangers or Astros or anybody else who is on DFW TV more than twice a year would be fine.